Kate and her little ones headed down the Mornington Peninsula last weekend for some special family time and took the opportunity to visit the Sunny Ridge Strawberry Farm to enjoy strawberry picking and to taste their delicious strawberry ice cream and gorgeous local produce. Thanks Kate for the cute pics and review. To follow Kate and her little adventure seekers, head to their Instagram page @kateflatman. There’s nothing quite like the taste of freshly picked strawberries. It’s hard to describe the juiciness and flavour – you definitely won’t get it from any supermarket! And there’s no better day out with the family than hunting through the fields at Sunny Ridge Strawberry Farm to find the perfect strawberry. For generations, Sunny Ridge has been one of the Mornington Peninsula’s most iconic and loved attractions. 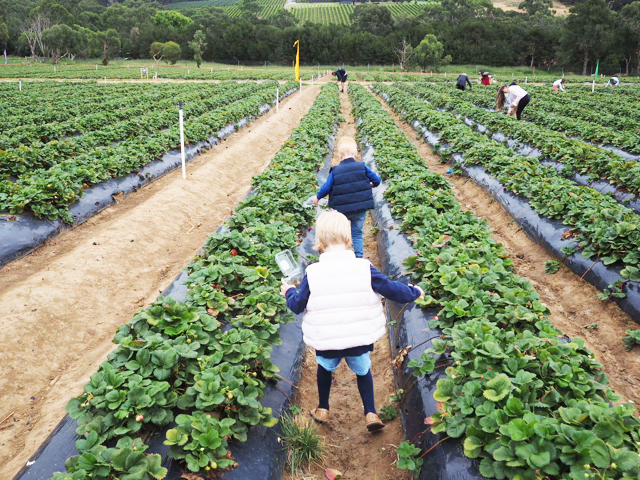 Set amongst scenic bushland and rolling hills on Victoria’s Hinterland property in Main Ridge, Sunny Ridge is now the largest strawberry farm in Australia. From November to April (U-Pick Season) visitors can purchase a punnet for strawberry picking at the farm shop and follow staff instructions on how to pick the best strawberries and location of the days’ picking field. With so many strawberries available on our visit, we took our time trying to find the biggest and juiciest ones! Once our punnets were full & the poppets had played on the red tractor next to the fields, we headed back inside to the cafe for morning tea. The bartender & I couldn't resist ordering a serve of freshly baked scones served with Sunny Ridge’s famous strawberry jam and a helping of double thick cream. Yum! Despite the cool weather, the ice cream cabinet was far to tempting for little people! Macy even let me have a lick of her choice - the award winning strawberry ice cream. With fully tummies, we couldn’t leave without buying some farm-made jam, local produce and a few strawberry-themed gifts to take home. 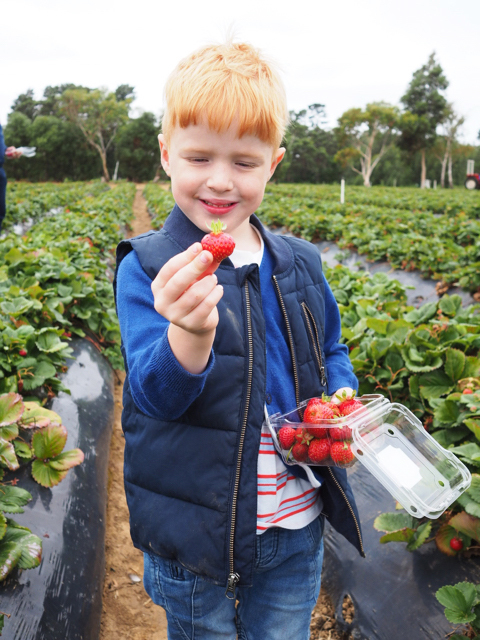 Strawberry picking at Sunny Ridge Strawberry Farm is fun for all ages and a perfect family activity to do in-between visiting the local wineries or food emporium on the Mornington Peninsula. Sunny Ridge strawberry season typically runs from November through to April. However, picking availability is based on a number of circumstances including weather conditions or farm machinery requirements. Strawberry picking can also be closed due to popularity, meaning that Sunny Ridge can be ‘picked out’. It’s very much first come, first served - so check social media updates before you visit & arrive early in the morning. The only rule for picking: you must be able to close your punnet lid otherwise additional strawberries will be charged. 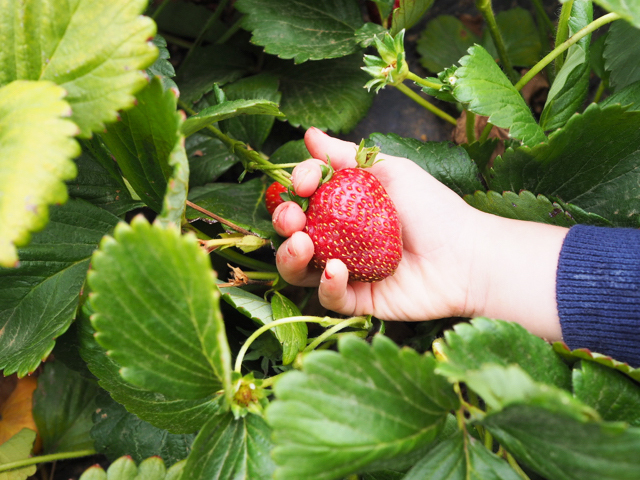 Don't forget your camera to capture the moment your little people spot the big juicy strawberries ready to pick. Sunny Ridge is relatively pram friendly; access to the strawberry fields is located down a small flight of stairs. Staff are available to assist with prams if required. Access to the strawberry picking from a pram is limited due to the row width. Don't forget to pack you hat and sunscreen as well as a water bottle - especially if visiting during summer as there is very limited shade available in the fields. FYI - disposable booties are available to cover your shoes if the fields are muddy. Busy City Kids were invited to pick gorgeous strawberries at Sunny Ridge Strawberry Farm for the purposes of a review. All opinions & feedback are genuine & truthful. Food, travel and parking were self funded. For more information on the Sunny Ridge Strawberry Farm, head to their website.